Since Monday afternoon, Shean Wenn suddenly developed what seems to be mild fever at first... by night, it was pretty high (39+c). That night & the night after, I spent around 3 hours each night applying wet towel on her forehead in attempts to bring the temperature down - together with doses of Ibuprofen & Paracetamol. My little "hoi sum gor" (cantonese for "Happy Chappy") was no longer a happy chappy those days. A visit to the GP revealed she has throat infections & anti-biotics was prescribed for her. Today she seems to be in slightly better mood & no fever. A Christmas gift by the Chip-Peas, she has taken to liking it alot. There are a few dials on top to select the mode of play your child will want to play with. I say play but it's highly educational as well. Currently, I find the mode of "Find the 1st letter of the word" suits her best. Basically, the voice will ask, "Can you find the first letter of the word... " and when you press the right answer, it will say encouragingly "Well done! You found the first letter of the word....." So far, she can identify most of the items on the board. 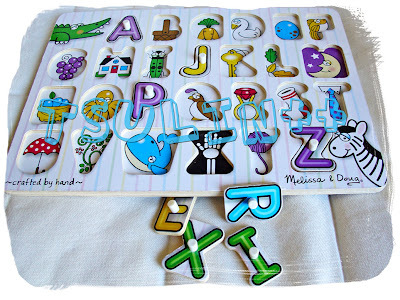 Pros : Helps build vocab & identify objects (for her age, but it will also help older kids to identify the alphabets & numbers, depending on which mode you choose). 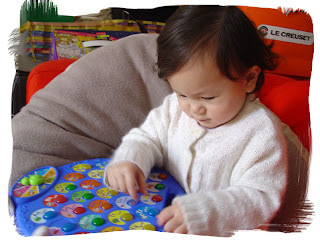 Also help develop motor skills (pressing the right button upon identifying the answer!). A gift from MIL/Daphne (SIL in Thailand), it's made of solid wood construction & have pictures under every piece of alphabets. She's identified almost every object on the board and daddy has been diligently teaching her new words every night. I was surprised few weeks ago, when she pointed to X-ray and told me "X!". She also knows the words Ring, Tie, Vine, Whale, Key & Leaves from there. 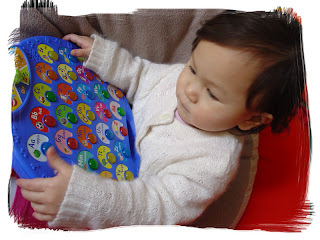 Pros : Great for motor skills & identifying shapes/objects/alphabets. These 100 pieces wooden blocks were a gift for her 1st Birthday from Meng's friend. The MIL told me not to allow her to play with it at that age (12 MO) incase she slipped & fell on/from the pieces. I waited till she was more stable & less clumsy (still quite clumsy but slightly better now) at the ripe age of 18 Months Old before I let her played with it. Besides making horizontal stacking, she also makes vertical stacking. I also find it amusing that she sometimes will put 3 blocks together & makes a train. How do I know it's a train? Because she pushes it around & says "Chooo chooo!"... The blocks are available in multi-colours and she also can identify her colours from it. The colours that she can identify now includes : Yellow (Nana, she says), Blue, Green, Purple, Orange (borange, she says), White & Red. Pros : Need I say more... developing motor skills, colour identification, imaginary play that breeds creativity, the list goes on! Cons : She will leave a block here & there just to annoy me for my daily exercise of bending down and picking them up! 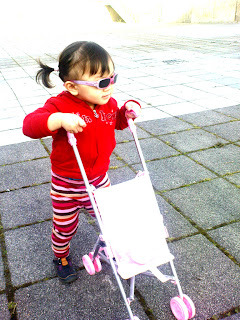 I recently decided to purchase a mini stroller for her because she seems to want to "do what the adults do" and searched high & lo for one "economical" stroller. I hunted for it in Tesco for at least 5 weeks before I realised they will never stock it up there :( and so went over to Asda on Monday to get it. It was the last one there and I'm so glad that I didn't have to pay more for it. (It was £4, if you must know) She has been happily pushing it around whenever I bring her down to the communal garden downstairs. Her dad has dis-allowed the stroller to be pushed around at home because it may damage the laminated flooring. Pros : Helps in her pretend play. Stress-testing the mini-buggy : Going over the manhole cover? PASS! 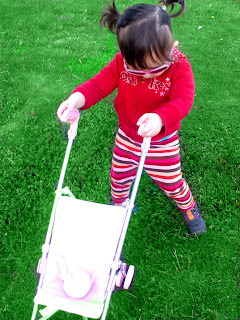 Stress-test 2 & 3 : Stroller going onto the grass & on tough gravel ground - both PASS!